A RUGBY-loving couple got to go behind the scenes with England as they beat Wales at Twickenham. 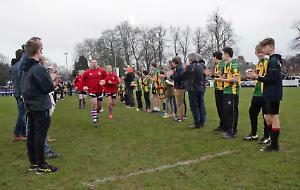 Carly Hadfield, who is captain of Henley Rugby Club’s women’s team, and her husband Jim, a Hawks player, met several past and present England stars and watched the team’s 12-6 victory in Saturday’s Six Nations match. They also came within a few feet of Prince Harry, who was a special guest at the game. The special day out was the prize in O2 Priority’s “Once in a lifetime” competition in which entrants had to say what rugby union meant to them. Carly’s entry was chosen out of 160,000 entries after she wrote about her history with Henley Rugby Club, where her father Nigel Dudding is director of rugby and she also met Jim, who has made more than 200 appearances for the first team. Carly, a PE teacher at Wallingford School, said: “I used to watch my dad play on a Saturday and my brothers play on a Sunday. Carly found out she had won not long before Jim’s 40th birthday on Friday and was stunned. She said: “I had to get a friend who works at the Rugby Football Union to check it was real. As part of their treat, the couple were able to watch the England players training at Pennyhill Park in Bagshot and were each given the national kit. The couple then had lunch with the players, who included prop forward Alec Hepburn, who won his second England cap against Wales and used to play with Jim, also a prop, in the Hawks team. They couple were also put up at a hotel for two nights and had breakfast with former England winger Ugo Monye, who recalled his interception try in the third British and Irish Lions test match in South Africa in 2009. On Saturday morning, the couple helped set up the team’s changing room. Just before kick-off they stood with England team manager Richard Hill to sing the National Anthem and then watched the game from the pitch side. Later, they had dinner with the England and Wales teams and their coaches and heard speeches by the victorious captain Dylan Hartley and coach Eddie Jones and their opposite numbers Alun Wyn Jones and Warren Gatland. Carly said the whole experience was thrilling. “We were in the tunnel when Prince Harry walked past, which was a special moment,” she said. “The girls from O2 who were with us on Tuesday said it was the first time they had put something like this together.